Hi friends! Today I'm chatting about one of our most recent adventures to the Brazilian Court Hotel in Palm Beach, Florida! I joke with my family that I'm continuing my "tour de beaches" series this summer with all these tropical destinations! It's no secret that my favorite type of vacation is one that involves the sun, sand, and turquoise water. So, when we had the opportunity to check out the Brazilian Court - I was thrilled. Below you will find a complete review of our weekend! The Rooms: The hotel offers a variety of room types. We stayed in a one bedroom suite with a den here! It was just Bailey and I in the room, and we had plenty of space! This is actually one of the biggest rooms her and I have stayed in together thus far, which was nice to experience. Each room is designed in classic Spanish Colonial decor including mahogany furniture, imported fabrics, crown molding and warm color palettes. The room had a large walk in shower, a full sized tub, and a floor length mirror which was handy for getting ready! Dining: The Brazilian Court Hotel is home to Cafe Boulud, Chef Daniel Boulouds award winning restaurant. Cafe Bouloud serves up a variety of modern French cuisine for breakfast, lunch and dinner. We had lunch at the restaurant, which was hands down my favorite meal of the trip! I ordered the risotto and added shrimp to it, while Bailey ordered the chefs special, which was a light white fish (delicious). The drinks here were also worth talking about! I'm a big Cosmo girl, and they recommended their white cosmopolitan, which comes with a beautiful ice cube shaped in a sphere complete with a violet flower inside of it (pictured above). It was almost too pretty to drink! All around, the service was fantastic, the food was spectacular, and the experience was flawless. If you're visiting Palm Beach, make a reservation to check this place out! They are also the hotels provider for in-room dining and pool side eats - we tried both and were not disappointed. Service: The Brazilian Court seamlessly executes service, making you feel like the most important guest in the hotel. I think our most memorable moment with service was being chauffeured to and from the beach in the hotels complimentary Escalade. A member of the hotel staff (Marcus, who was awesome) set up beach chairs and umbrella for us upon arrival, and carried our complimentary hotel beach bags stocked with towels and cold waters! Hello, celeb status. Grounds: Lush tropical courtyards, Spanish Colonial architecture, and pretty fountains are what you can expect to see around you at The Brazilian Court. Crews are working around the clock to ensure plants have water, chairs have towels perfectly placed, and that pool decks are washed off and clean. You can tell the hotel takes great pride in keeping the grounds tidy! Keep in mind this property is 92 years old, and modeled after a Palm Beach estate home. It is the second oldest hotel on the island and served as a big hangout in the 40's and 50's for celebrities and their mistresses. 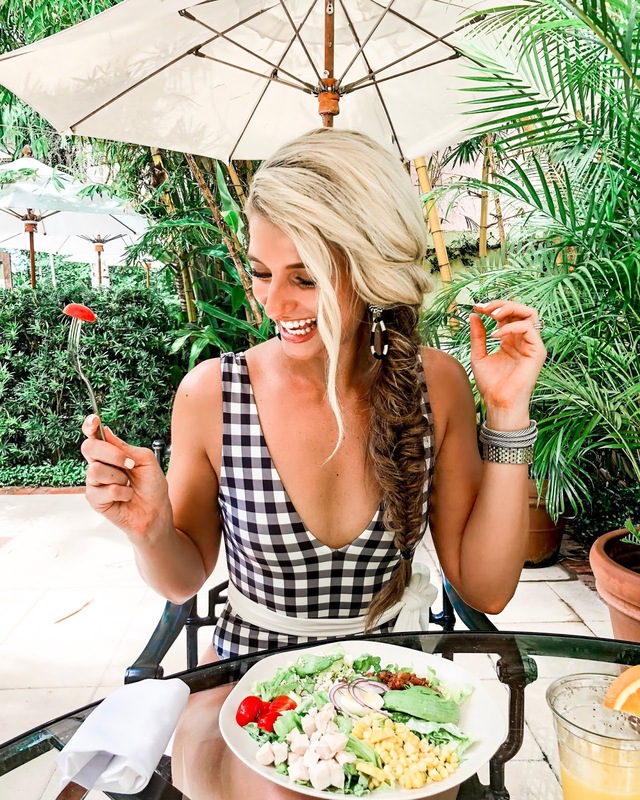 The Hepburns, The Kennedy's, Sofia Vergara, and a Bravo TVs Real Housewives star have all indulged in a stay at the Brazilian Court Hotel, and I see why! If you're looking for a boutique hotel, lots of personality, and a luxury experience - give this place a look.